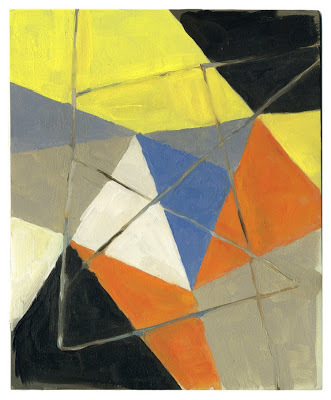 John Davis Gallery in Hudson, NY, kicks off the summer season this week with a group of solo shows by five women artists. I asked John why he was showing all women, and he said that it wasn’t a conscious decision—he just sees more women making interesting art than men these days. He has installed work by four abstract painters (including me) in both the front galleries and the sublimely quirky Carriage House, and a figurative sculptor in the Sculpture Garden that separates the two buildings. I’ll be at the reception this Saturday, May 30, from 6:00 until 8:00 p.m., so if you’re in the area, please stop by. Rosanna Bruno’s interest lies in the process of painting itself. 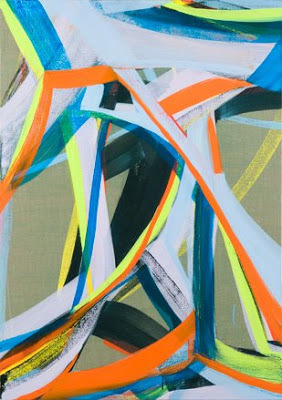 What especially engages Bruno is the challenge of making non-mimetic images that sublimate her ongoing (and entirely natural) struggle with line and color to exude a loose playfulness and apparent spontaneity. “I feel it’s possible to work out the jumble of constant visual stimulation through the experience of just making,” Bruno says. “It is a form of translation, utilizing the language of paint to speak to endless experiences.” According to John, eminent painter Louise Fishman thinks Bruno is one of the best painters out there right now, and I’d have to agree. Regular Two Coats readers might remember that I worked in a solitary 4′ x 5′ shack in Beacon, NY, last summer. I had heard of a project called “Habitat for Artists” from Chris Albert, a blogger I met during the Blogger Conference at the Red Dot Fair in the spring. “Habitat For Artists” was organized by artist Simon Draper, who built twelve small sheds on the grounds of Spire Studios and invited a group of artists to use them for the summer. Traveling to Beacon was more time-consuming than working in one stationary location, and I painted less on days spent there, but expanding my world enriched my work. The shack was just a few blocks from Dia:Beacon, which is known mainly for a resolutely intellectual brand of minimalism, but installations by colorists Blinky Palermo and Imi Knoebel impelled me to consider color. As the summer unfolded in the shack, I extended the limited, austere palette I’d been using for years to include the entire spectrum. The scale, handmadeness, and intuitive form of these small paintings constitute an emotive and spontaneous counterpoint to the cerebral and exhaustive exploration of mathematical and geometric constructs and the meticulous experimentation with industrial materials I confronted at Dia:Beacon. 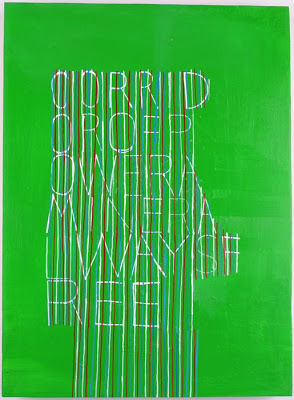 In a semi-free-associative process, EJ Hauser conjoins thickly painted canvases with text panels based on her notebooks. “My notebooks serve as a kind of personal repository for images and words that I think of as energy and force. While working in the notebooks, I also make drawings, clip images from the newspaper, and write down strings of words,” Hauser says. “ These drawings and lists become the origin for my paintings. 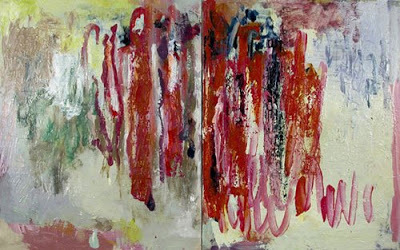 I basically develop the heavy paint paintings similarly to how I develop the word paintings. An idea (word or image) goes up on the panel, and I react to it building layers, adding and subtracting, looking for something resonant.” Shown at Never Work (2008) and selected by Brent Burket last year for “Unbreak my Heart” at Pluto, Hauser’s beautiful and mysterious paintings are about the act of uniting: chaos and control, thought and feeling, high and low. Can’t we all just get along? 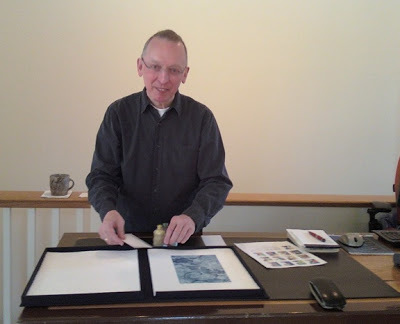 Here’s an image of John, showing me the first portfolio produced by John Davis Editions. Nine gallery artists created original pieces using traditional printmaking processes, in a limited signed edition of 50. Collectors can subscribe to the entire series or buy prints individually. Artists include La Wilson,McWillie Chambers, Renee Iacone Clearman, Daisy Craddock, Paul Hamann, Joseph Haske, Christine Heller, Jon Isherwood, and Sara Jane Roszak. John Davis Gallery, 362 1/2 Warren Street, Hudson, NY. Through June 21.